IWAKI, FUKUSHIMA PREF. - The first wind turbine in an experimental project by the University of Tokyo and 10 companies started generating electricity Monday off the coast of Fukushima Prefecture. 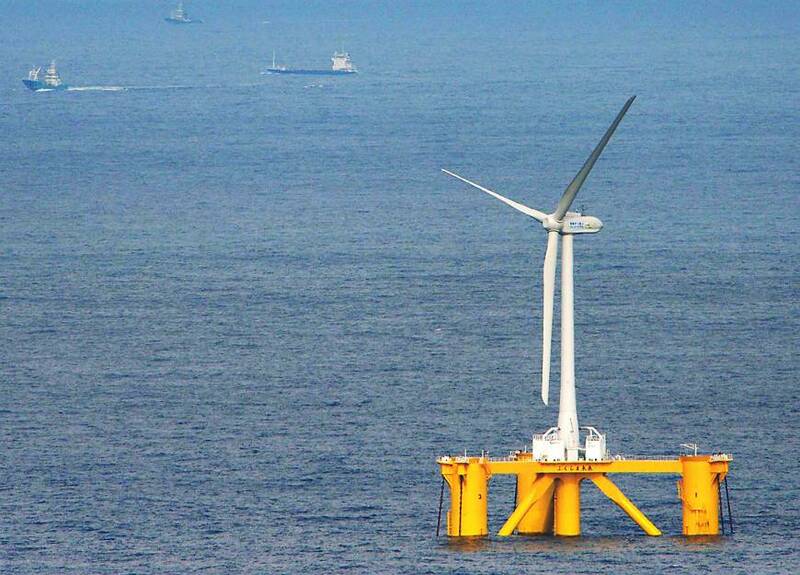 The turbine, equipped with 80-meter-long blades, floats on the sea some 20 km off the town of Naraha. It will deliver up to 2,000 kilowatts to Tohoku Electric Power Co. through a floating substation and underwater grids, according to the Fukushima Offshore Wind Consortium. The Fukushima Floating Offshore Wind Farm, or Fukushima Forward, is also funded by the Ministry of Economy, Trade and Industry. The consortium plans to install two more 7,000-kw turbines by March 2015. Naraha hosts Tokyo Electric Power Co.’s Fukushima No. 2 nuclear plant, which, like all other nuclear plants in Japan in light of the nuclear disaster at nearby Fukushima No. 1, is shut down. The wind farm is eventually to have a generation capacity of 1 gigawatt from 143 turbines, though its significance is not limited to the energy it will produce. Symbolically, the turbines will help restore the role of energy supplier to a region decimated by the multiple meltdowns that followed the March 2011 earthquake and tsunami. It also highlights the nation’s aspirations to utilize its advanced energy technology from cleaner versions of conventional coal-, oil- and gas-burning thermal power plants to renewables and also nuclear power. All 50 of Japan’s viable nuclear reactors are offline for safety checks under new regulatory guidelines drawn up in light of the Fukushima disaster. Utilities have applied to restart at least 14 reactors under the new guidelines, which include more stringent requirements for earthquake and tsunami protection, among other precautions. “We are moving ahead one step at a time. This wind farm is a symbol of our future,” said Fukushima Gov. Yuhei Sato, who has lobbied hard for support following the 2011 disasters. Trading houses including Marubeni Corp., which is leading the consortium building the offshore wind farm, are investing aggressively in renewable energy as well as conventional sources, helped by government policies aimed at nurturing favored industries. The push to tap more renewable sources to help offset lost power capacity and reduce costs for imported natural gas and oil also got a boost last year with the implementation of a higher wholesale tariff for energy generated from nonconventional sources. Japan, whose coast is mostly ringed by deep waters, is pioneering floating wind turbine construction, required for seabed depths greater than 50 meters. The 2-megawatt downwind floating turbine that began operation Monday is tethered to a seabed 120 meters deep. The turbine is linked to a 66-kilovolt floating power substation, the world’s first according to the project operators, and an extra-high voltage undersea cable. As the government and Tepco struggle to clean up from the nuclear disaster and begin the decades-long task of decommissioning Fukushima No. 1, the energy industry is in the midst of a transition whose outcome remains uncertain. Most leading members of the Liberal Democratic Party and powerful business lobbies such as Keidanren, and many experts, argue that wind and other renewables alone simply cannot make up for the steady and huge base load power produced by nuclear plants. He cites figures showing wind power’s average generating capacity at 2 watts per sq. meter versus 20 watts for solar power — and 1,000 watts for nuclear. Eventually there could be dozens of wind turbines off Fukushima’s scenic but deserted coast. The project is meant to demonstrate the feasibility of locating these towering turbines in offshore regions where the winds are more reliable and there are fewer “not in my backyard” concerns — bigger turbines that might create noise problems onshore are not an issue so far offshore. 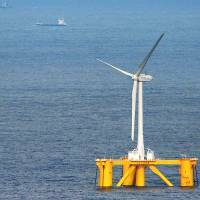 In theory, Japan has the potential for 1,600 gigawatts of wind power, most of it offshore. About a dozen projects are already in the works. But wind power can be notoriously unstable: When switched to “on” Monday, the audience of VIP officials watched tensely as the wind turbine’s blades, displayed on a video screen at a tourist center onshore, appeared not to move. Eventually, though, the blades slowly began rotating.